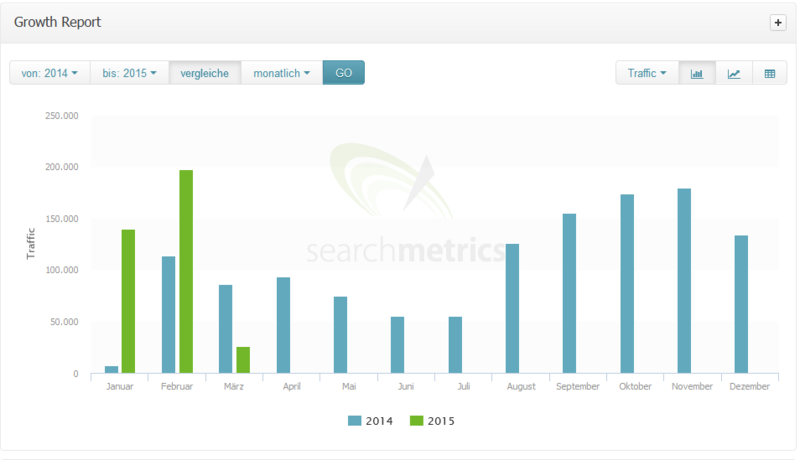 On 6 March 2015, we published an update for the Searchmetrics Suite, which includes fantastic new features. Growth Reporting is new to the Suite, giving you all the relevant data on the organic performance of a domain at a glance. This allows you to create reports in around 50% of the time. We have also improved the popular Content Optimizations, particularly in terms of usability & performance. But before I go into further details on the features, I would like to put the spotlight on our extended research database. In order for Searchmetrics to be able to increase your performance in the online business, we are continuously developing: The Suite has the largest competitive research database for SEO and PPC in the world. The size of the database is so important because it’s the only way to analyze how holistic websites are. Nowadays, it’s no longer about individual keywords that a webpage should rank for, it’s about whole topics. With our data-driven approach we can analyze the performance of landing pages, which rank for many keywords, because they are comprehensive in terms of content. 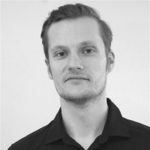 150% more data in the research database for SEO and PPC: More insight into the performance of your content. Up to 50% more keyword data than from any other provider: This gives you an advantage in finding and optimizing all your keywords and landing pages. Analyze new and fresh keywords: Be more up-to-date with the Suite than with any other research database. More insights into your competitors: Meaning more information with which to derive a successful SEO and PPC strategy for your success. Our aim when it comes to the Searchmetrics Suite is to improve the leading global search and content optimization platform for your requirements every day. With Growth Reporting you will benefit in one way above all others: It will save time when creating reports. Now these metrics can be seen at a glance. The report creation for this data is now possible in less than a minute. The new dashboard can be adapted to business-relevant time periods of your choice: month, quarter or year. The growth development of this data can also be taken into account – this allows an overview of the organic traffic in comparison to the previous month or the previous year in the form of a line chart, bar chart or table. Here we want to give you an efficient opportunity to receive relevant data from the Searchmetrics Suite at a glance and to be able to process them further. Growth Reporting is primarily intended for agencies and enterprises. Both management and agency customers want to have these decisive KPIs at a glance without daily deep insight into the Suite and its complexity of data. 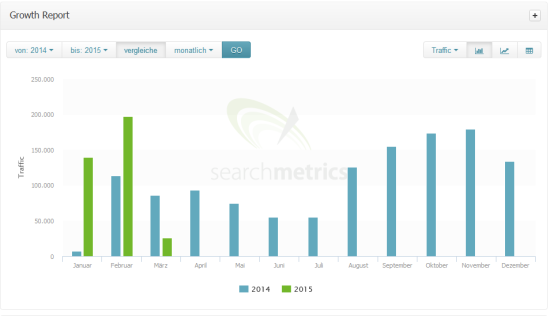 You can find the Growth Reports with information for SEO Visibility and SEO market share on the project overview page. Furthermore, the Growth Report menu item is available directly below the overview, where you can find statistics on traffic and a maximum of four individually definable conversion targets. These metrics can be added to your dashboard with a click. Since its introduction, Content Optimization has gathered growing popularity with our customers. Our latest update increases the speed of the platform and allows an even better evaluation of your data. 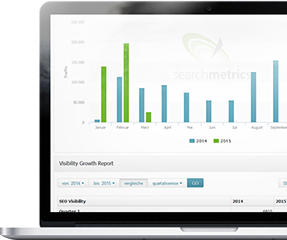 All Searchmetrics Suite customers benefit from the improvements in this area. Along with faster performance and stability the setup details can be viewed directly on the evaluation page, with the goal of a faster overview. A designation option for simpler traceability and comparability of various optimizations is also available: Customers can assign names for Content Optimizations; previously the chosen (main) keyword was automatically used as the analysis name. Furthermore, older analyzes can be easily deleted. Furthermore, the content evaluations can be added to the dashboard; this was a request from many of you, which we have now made a reality. This allows you to add both the optimization evaluations and handling recommendations to URL-centered dashboards. Name executed Content Optimizations, delete irrelevant ones. Add content evaluations to a dashboard. Enjoy improved performance and stability. Please find more information in the product news for this actual release.